Support, and/or volunteer in its activities. Join the Tiger Trust as a subscriber and receive Newsletters and the Annual Report on request. Order publications and other educational materials from the Tiger Trust at discount prices. 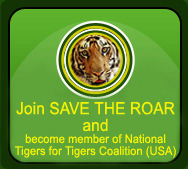 Spread the news and tell others how to join and support the Tiger Trust !